Last week we rolled out a refresh to our national events calendar making it even easier to find events. We see a lot of emails and social media announcements from organizations telling their attendees to go "register for the event on MotorsportReg" without providing the event-specific link. One of the awesome features of MotorsportReg is that we have thousands of events listed on our calendar each year. But this also means that an attendee without a link has to do some keyword searching and sorting in order to narrow down the results to find the specific event they're looking for. And you'd be surprised how many people don't really know what organization they're running with. They'll know the date and venue and that's about it. With the new update, the calendar will automatically narrow down the list of events based on your current location, without entering any search terms. Enter a keyword or two and you will quickly find the event you're looking for. We also made it easier to find events by venue since so many users search that way. 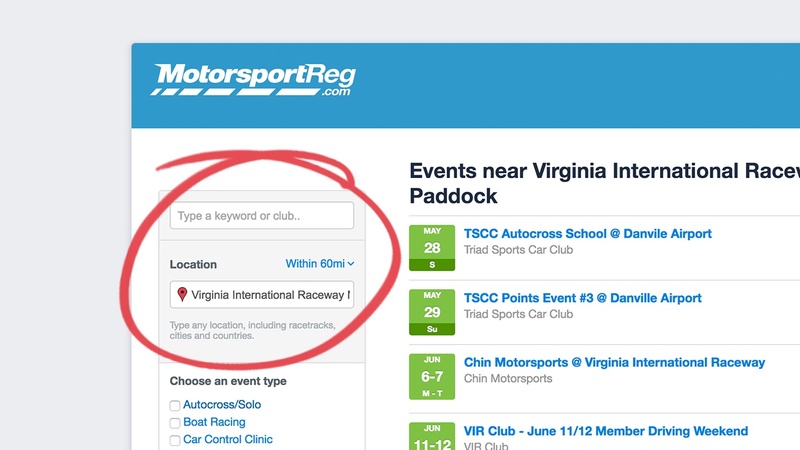 Previously we used full text search in the search box which meant that if you entered "VIR" for Virginia International Raceway, you may not have found what you're looking for. A location auto-complete box makes it easy to pin point an exact area like "Virginia International Raceway" or something more broad like, "San Francisco" or "Texas."